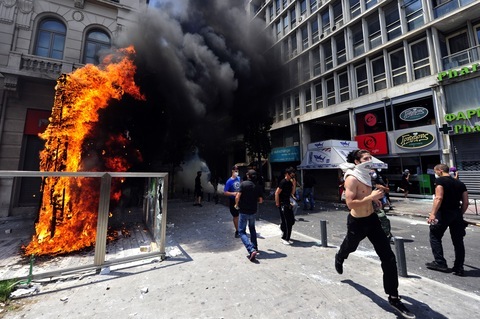 Protesters in Athens run away from riot police on Tuesday. Photo by Aris Messinis/AFP/Getty Images. Protesters in Athens are clashing with police as a 48-hour general strikes kicks off ahead of an expected vote in parliament over controversial austerity measures. Greece is in danger of becoming the first eurozone nation to default on its debt and must pass the measures in order to secure funds from the European Union and International Monetary Fund to avoid defaulting in July. The vote would pave the way for the next release in a 110 billion euro bailout package. Thousands of protesters amassed in Athens as public transportation, banks, hospitals and public services have been disrupted by the strike. Flights have also been cancelled or delayed. Police fired tear gas at demonstrators, some of whom threw rocks near the country’s financial ministry. The two-day strike was called by unions angry at new taxes imposed by the proposed austerity measures, which they say would harm Greece’s minimum-wage and low-income earners. The measures would come on top of existing tax increases and spending cuts. According to public opinion polls, the majority of Greece’s citizens oppose the proposed austerity measures. Treasure Secretary Timothy Geithner said Tuesday that the United States endorses French finance minister Christine Lagarde to replace Dominique Strauss-Kahn as head of the International Monetary Fund over Mexico’s central bank governor Agustin Carstens. Lagarde’s candidacy had raised ire among representatives from some developing nations who said the post had thus far been dominated by Europeans. 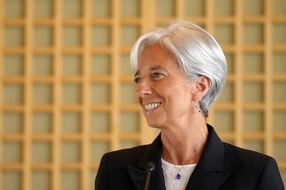 Despite the criticism, Lagarde has emphasized that she would push for a shift toward developing nations. If selected, she would be the first woman to hold the post. The vote by the organization’s governing board could happen as early as Tuesday. Strauss-Kahn remains imprisoned in the United States on charges of sexual assault brought by a maid in a New York City hotel. New Mexico’s Las Conchas wildfire continues to burn in the mountains near the town of Los Alamos, home to the Los Alamos National Laboratory. Firefighters are working to contain the blaze, which has already consumed some 44,000 acres, as strong winds hampered their efforts Tuesday morning. The fire was described as 0 percent contained. The laboratory, where the first atomic bomb was developed, has been closed. Officials said that any radioactive materials there are safe and that materials on the site were stored in a way that would withstand the flames if they reached the area. Some 13,000 residents have been evacuated. Abdul Qadeer Fitrat, the governor of Afghanistan’s central bank, has fled for the United States and said he will not return. Fitrat said he feared for his life after his efforts to investigate members of the bank on charges of corruption were disrupted by government officials. Kabul Bank, which is responsible for the majority of government salaries, nearly imploded last year when the bank allegedly made fraudulent loans and hundreds of millions of dollars went missing. President Hamid Karzai’s brother and other members of his family were accused in connection with the bank’s missing funds. Karzai said he would launch and investigation. The International Monetary Fund has called for a replacement bank.